This Michael Kors broderie anglaise-paneled dress was saved in my bookmarks for the longest time. 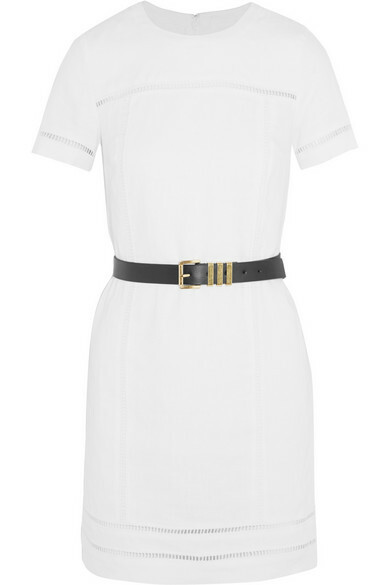 I knew I had to have it, but I just couldn't justify buying a gorgeous white summer dress in the middle of winter. I waited and watched and ummed and ahhed over sizes. It ticked all the boxes: timeless, great cut and 100% linen (a gorgeous fabric that needs ironing but is thick and luxurious). Then Net-A-Porter had their end of financial year sale. And now it's mine. I bought a medium and I'm so glad I did because I think the small would have been a bit tight across the bust (and linen has zero give). I can't wait until it's warmer and I can wear it outside the house. Yes, I am that weirdo who wears their purchases around the house. I love it so much and can see myself wearing this into my forties and fifties! Now is a great time to reflect on how the 5 Piece French Wardrobe has gone for me. Six months in and I'm going strong-ish. I still get tempted when I see a style of skirt or jumper (turtle-necks anyone?!) everywhere, but find those periods fewer and further between. I'm definitely less tempted by sales now and can easily say no to things because I know at a glance what I will actually wear. Do I have any regret purchases? Actually my first choice, the Rebecca Minkoff dress, is my most regretted piece! I thought I would wear it a lot more than I have, and am really hoping that changes when the weather warms up. I've realised the need to get good basics. I literally bought a plain white t-shirt last week and still can't explain how I didn't have one until now! I'm hoping to buy an amazing A-Line leather skirt as well and just got a fantastic pair of dark blue jeans from Uniqlo. My favourite piece is without a doubt the Marcs Mademoiselle Sweater. I've worn it every week (sometimes twice!) and every time I put it on I feel like it's really me.